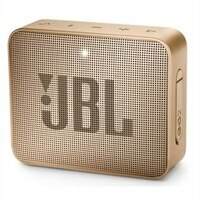 JBL Go 2 Portable Bluetooth Speaker 3 Watt - Pearl ChampagneThe JBL GO 2 is a portable, compact Bluetooth speaker with next-generation audio quality and a bolder design. This next generation of the fan-favorite JBL GO speaker packs a punch, with even more audio output in the same compact palm-sized design. With long-lasting playtime and JBL Signature Sound, coupled with increased audio quality and performance, the JBL GO 2 is the perfect speaker for consumers looking for an easy-to-use, on-the-go music experience. Making a splash with its waterproof IPX7 design, the JBL GO 2 gives music lovers everywhere the opportunity to bring their speaker poolside, to the beach, or on a porch or patio. For consumers looking for more versatility in a portable speaker, the JBL GO 2 comes equipped with an echo and noise canceling speakerphone. Users can make crystal-clear calls by simply connecting their smartphone via Bluetooth. The JBL GO 2 is a portable, compact Bluetooth speaker with next-generation audio quality and a bolder design. This next generation of the fan-favorite JBL GO speaker packs a punch, with even more audio output in the same compact palm-sized design. With long-lasting playtime and JBL Signature Sound, coupled with increased audio quality and performance, the JBL GO 2 is the perfect speaker for consumers looking for an easy-to-use, on-the-go music experience. Making a splash with its waterproof IPX7 design, the JBL GO 2 gives music lovers everywhere the opportunity to bring their speaker poolside, to the beach, or on a porch or patio. For consumers looking for more versatility in a portable speaker, the JBL GO 2 comes equipped with an echo and noise canceling speakerphone. Users can make crystal-clear calls by simply connecting their smartphone via Bluetooth.